Product #21658 | SKU M O F I | 0.0 (no ratings yet) Thanks for your rating! 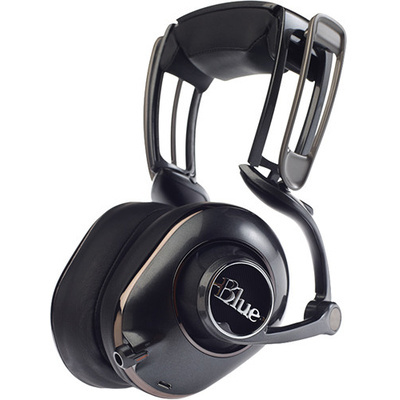 The Blue Mo-Fi Powered Headphones innovate on the traditional closed-back over-ear headphone design with the incorporation of an internal all-analogue audiophile amplifier. This allows the headphones to work well with low output sources such as smartphones, tablets, and other mobile devices. The headphones can operate in passive mode without the headphone amplifier, in active mode with the amplifier, or in bass boost mode, which adds additional low frequency energy to the signal. The addition of an integrated amplifier within the headphones allows for the use of 50mm fibre-reinforced dynamic drivers to deliver a frequency response of 15 to 20,000 Hz, making it suitable for everything from professional music production to recreational listening. Blue also re-worked the physical design of the headphones to solve some of the issues traditionally encountered with over-the-ear designs. Inspired by the suspensions found on Formula 1 racing cars, the headphones feature a multi-joint hinge system with height adjustment, camber angle adjustment, and an adjustable tension knob to accommodate heads of all shapes and sizes. The size adjustments improve the quality of the acoustic seal and ultimately the audio performance of the headphones. They also feature ear-shaped earcups intended to provide better comfort and keep the earcups in parallel alignment to improve the imaging and maintain a consistent frequency response. The multi-hinge design also allows the headphones to fold into a more compact form factor for storage and travel. The amplifier features a built-in rechargeable battery that can provide 12 hours of run time on a single charge. An intelligent power management system automatically detects and powers off the headphones when they are removed from your head and powers them back on when they are re-positioned on your ears. If the battery runs out, the headphones can still be used in passive mode. They come with a soft case with cable storage pocket, a 1.2 metre audio cable with iOS in-line remote control, a 3 metre audio cable, a 1 metre USB charging cable, an AC charging adapter, 3.5mm to 6.35mm TRS adapter, and a two-prong aeroplane connector.